You can hardly go wrong wearing comfortable sporty/athleisure inspired looks and track pants remain one of my favorites. This sporty trend creates a comfy, stylish and street style chic appeal without trying too hard. For today’s post, I am showcasing two ways of styling track pants. This slim track pants with contrasting side stripes has an elastic waistband with drawstring ties for comfort. You can either pair with sneakers like I always do when I'm hanging out with Nolan or running errands on the weekends or you can pair with heels -- great for stepping out with girlfriends or for work. 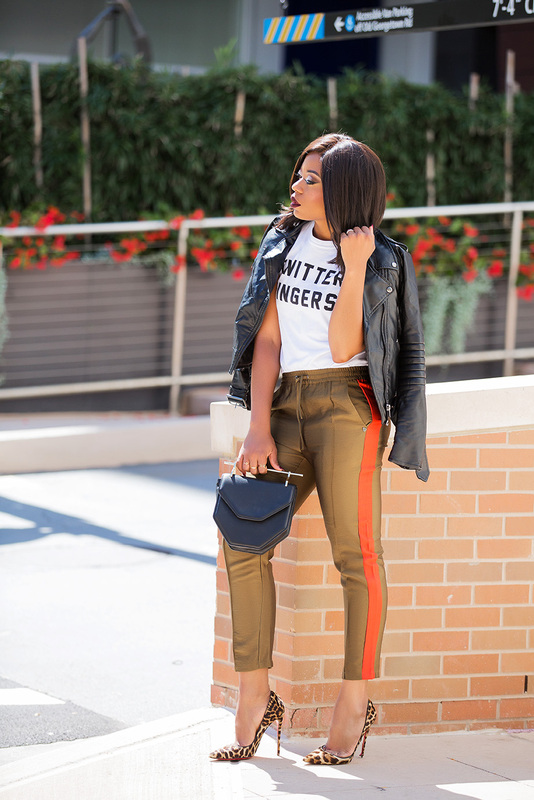 Another great way to style track pants is to pair with graphic tees or simple white tees. You can also pair track pants with button down shirts, blouses or sweaters with heels for work. If you follow my Instagram Story, you might have seen how I styled my track pants (worn here) for work with a red sweater on last Monday. Darling love ❤️ those leopard pumps ! They make the this outfit hot ! Love wearing them with heels to give it that sporty chic look!